It is not uncommon for outside contaminants including odors and allergens to find their way migrating into a building. Restaurant odors, manufacturing off-gassing, diesel fumes from idling trucks even jet fuel from helipads can be pulled into the make-up air and distributed throughout the HVAC system and building. Sanuvox Technologies’line of in-duct UV air treatment systems are the ideal solution for these often troublesome issues. Sanuvox offers exceptionally cost-effective systems that can address IAQ issues that filters and absorption media cannot. OBJECTIVE: Substantially reduce odors introduced into the workspace, offices, schools, hospitals, etc. due to the supply of contaminated “fresh” air from outside. For example: odors from restaurants, factories, diesel engines, sewage, etc. that are drawn into the building by the HVAC fresh air intake. EQUIPMENT: Duct mounted units installed in the return or supply side of the HVAC system parallel to the airflow and supplied with multiple Germicidal UVC lamps, each with a section of Oxidizing UVV that can be adjusted (covered or removed) depending on the concentration of odors. 1. The oxidizing UVV section of the lamp reduces the chemical components in the air through photooxidation. 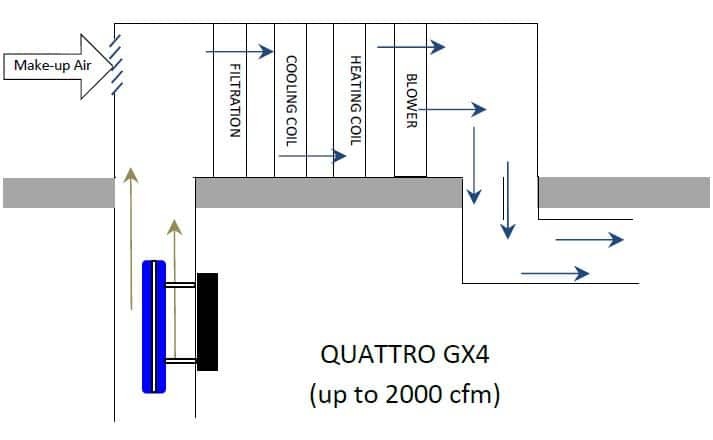 Select units are designed to be “dosed” on site, such as the QUATTRO GX4. 2. The germicidal UVC section destroys airborne biological contaminants (viruses, bacteria, mold). Ultraviolet photon energy (170-220nm) is emitted from a high-intensity source to decompose (break-down) oxygen molecules into activated monoatomic oxygen. The rate of production or effectiveness of this process depends on the wavelength and intensity of its source. The activated oxygen atoms (O*) are then mixed in the airstream; the process will react with any compound containing carbon-hydrogen or sulfur, reducing them by successive oxidation to odorless and harmless by-products. If airborne contaminants are outnumbered by the activated oxygen atoms, then there will be formation of residual ozone (O3) which will occur following the oxidation of normal oxygen molecules (02).